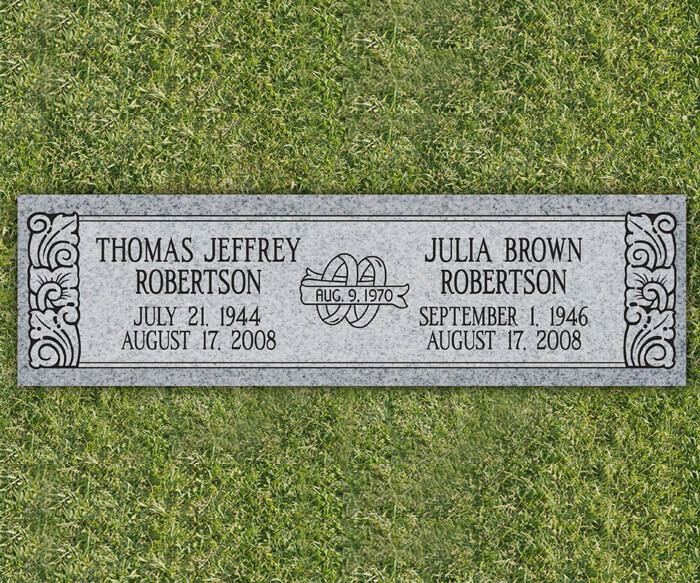 Upright monuments are themost popular memorials. They have a wide variety of shapes, sizes and finishes.The die (or tablet) can range in thickness from 6 inches to 12 inches. A Typicalmeasurement for a single die is 24 inches in length, 6 inches thick and 20 to24 inches high. The base will measure 36 inches long, 12 inches wide and 6 incheshigh. For a companion monument, the standard measurement for the die can rangefrom 42 to 48 inches long and have a base of up to 60 inches in length. Thesesizes are standard but can be made larger or smaller, depending on preference. A Bevel Marker, also known asa pillow memorial, sits flat on the ground. It measures 6 inches high at theback of the stone and 4 inches high at the front of the stone, giving the facea 2 inch drop or beveled top. Standard measurements for bevels are similar tograss markers: single - 24 inches long, 12 inches wide and 6 inches high;companion - 48 inches long, 12 inches wide and 6 inches high. Bevel markers donot sit flush with the ground. A Grass Marker is a marker that sits flush with the ground. 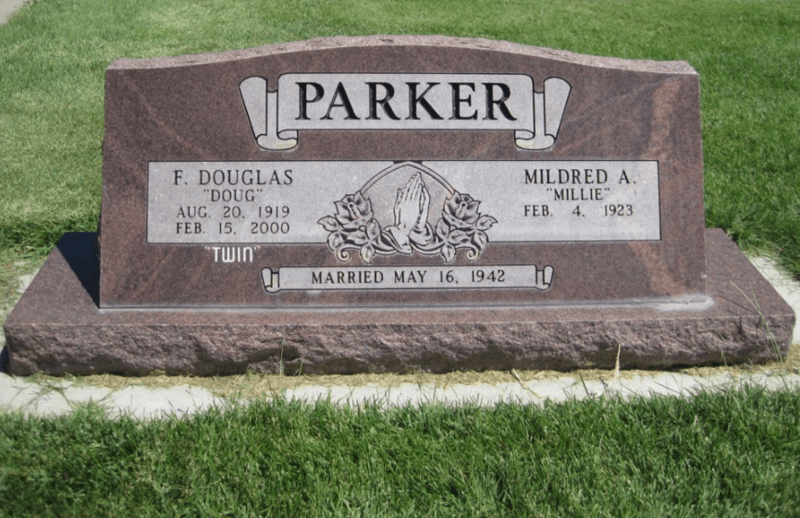 Many urban and perpetualcare cemeteries prefer these markers because lawnmowers can pass over itwithout hitting the stone, making lawn care easier. The marker typicallymeasures 4 inches from the ground up to the top of the granite. Standardmeasurements are: single - 24 inches long, 12 inches wide and 4 inches high;companion - 48 inches long, 12 inches wide and 4 inches high. The length andwidth can be made larger or smaller, depending on preference. 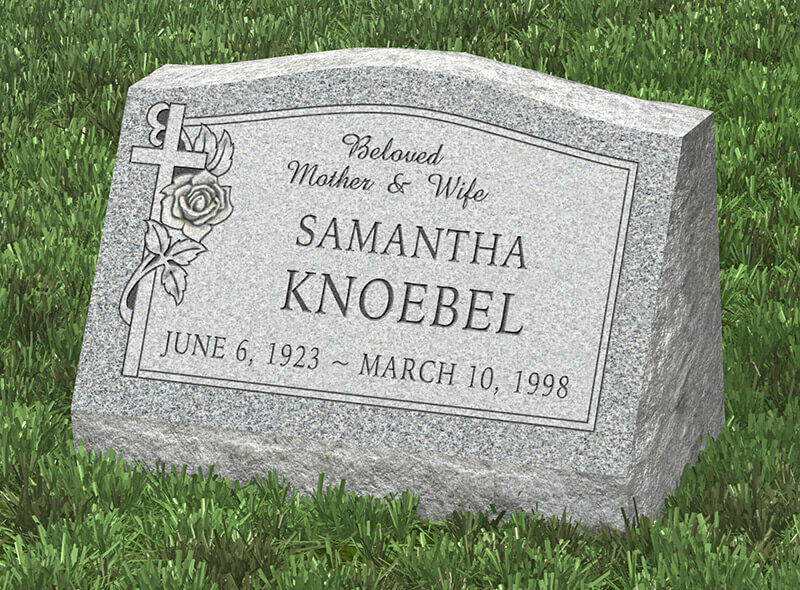 Some cemeteriesonly allow flat markers in specific sections, so check with your cemeterysexton to determine what is allowed in your area. 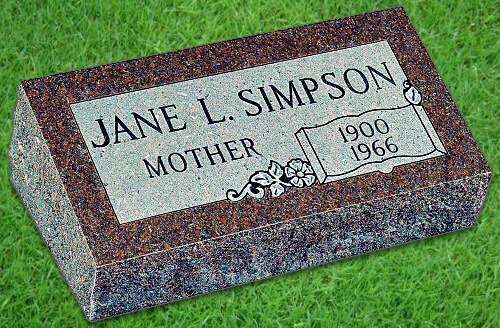 A Slant Memorial has astraight back, a flat bottom and a slanted face. It can have an oval,serpentine or straight top. The bottom is typically 10" wide from front toback and tapers up to the top. This means that the slant can be set directly onthe ground or concrete pad without needing a granite base for support. Somefamilies do prefer to have a granite base under the slant for height. A singleslant typically measures 24 inches long, 10 inches wide and 16 inches high; acompanion slant will measure 48 inches long, 10 inches wide and 16 inches high.